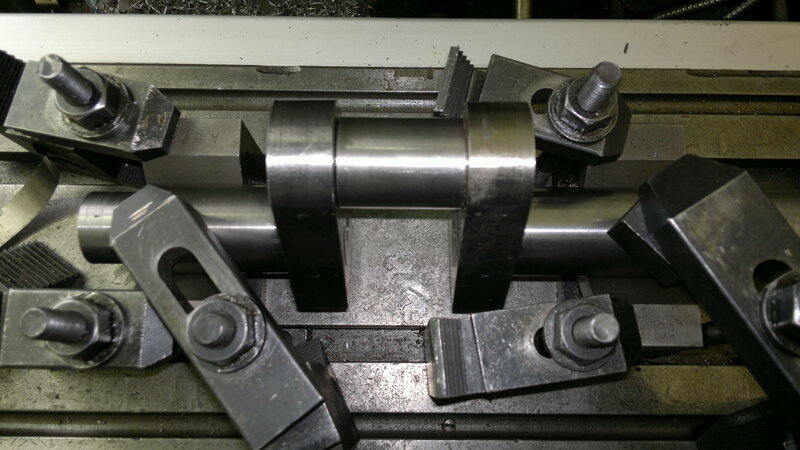 DO NOT FOLLOW THIS APPROACH – Loctite and crankshafts are not a good mix. Either carve/cast from solid or shrink it all together with larger webs. The previous posts discussed the manufacture of the webs and journals, and I felt very confident of the approach. Half the joints were to be shrunk together (very cold journals, warm webs, and a press (large vice)) and the others were to be loctited in place. The theory being that the press/shrink fits are bound to be square (as the holes and journals already are, and there is no spare space for out-of-aligned-ness), and then the loctite joints are assembled with the journals fitted into V-blocks, thus ensuring everything was straight and true … how wrong can you be? Out with the engineer’s square and dial-gauge and we discover that the press fits are not square… Much head scratching, and a few tentative (and then very hard) clouts with rubber mallet prove that it’s all MUCH to solid to bounce back into shape. So I google “crank straightening” and discover “peening”. The idea being that by hammering (with ball-peen hammer (always wondered where the name came from)) the surface of the bent web you release surface stresses (as a result of stretching the surface with the hammering) and the web bends towards you. Well it almost worked, I cheated and used a pneumatic chisel with a domed tool in it, and as predicted the dial gauge confirmed that everything was coming back into shape. With a run-out of less than about 3 thou I was feeling very positive. I figured I would give it one more treatment and get it “bang-on”. But I seemed to over-cook it and it was bent the other way (quite a lot), so I set too on the other side, to bring it back, but it just seemed to get worse and worse (starting to feel stressed now! 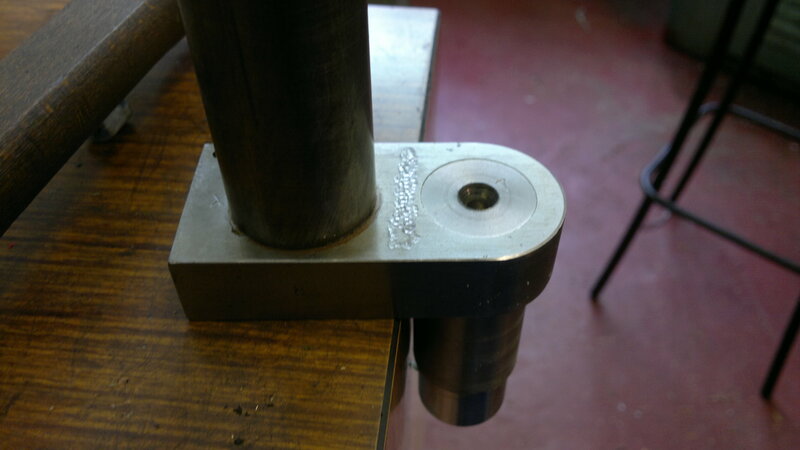 )… after a few more attempts I realised what had happened was that I had managed to break one of the loctite joints and the error I was trying to correct be peening web #1 was actually as a result of a joint on web #3 moving – by the time I realised this I was in a right two-and-eight! It was now clear we were in serious trouble, so I heated the whole thing up until the Loctite let go, pull the pins from the webs, clean everything up and start again. I really thought this time it would go better, but no, runnout on the journals when spun between centres was about 20-thou, and while you could get the crank into the bearings it was stiff to turn, and I figured it would just murder them over time, so it’s time to give up! This entry was posted in The Power Plant and tagged broken crank, crank, crank failure, lathe work on July 30, 2012 by sybefur. Also note that experience has shown that this form of fabricated crank is not fit for purpose, and most fail in service…. Further thought and discussion suggests the real issue is that there is not enough meat on the webs (as drawn) to withstand the shrink fit stresses, and so they distort as they cool….. (should post somthing in the hints and tips section….